Paladins is the latest game from the makers of SMITE, Hi-Rez Studios, and features a wide array of Champions between four different classes. Acting as a cross between a MOBA and a first-person shooter in the style of Overwatch, Paladins has been gaining quite a bit of traction following its initial release on Steam. Recently, Paladins launched on PS4, Xbox One, and Nintendo Switch in addition to hosting a sale of its Founder’s Pack. Included in the Founder’s Pack are exclusive items, and of course, having all playable champions unlocked without having to grind for Gold. If you’re new to Paladins, or are simply trying to figure out which Champions to purchase next, we’ve listed the out the best Champions available in each class! 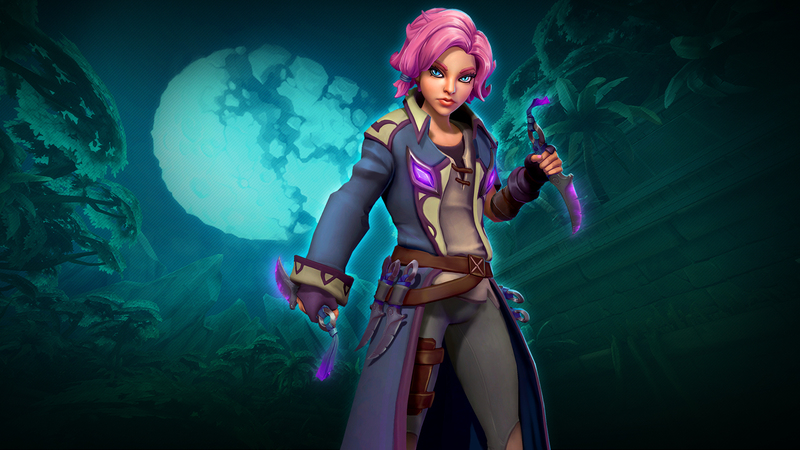 Maeve is a great Flank Champion when it comes to sheer Damage output in Paladins. It’s difficult to say who is better between the two, Maeve or Lex. Certainly, Maeve is a better Flank champion when it comes to speed, though she lacks Lex's accuracy. Daggers: Maeve throws two daggers every second, dealing 450 damage. Pounce: Maeve quickly dashes forward. If Maeve collides with an enemy and performs a melee strike, she deals 500 damage. Nine Lives: Maeve resets the cooldowns for Pounce and Prowl. Prowl: Maeve moves 65% faster and increases her jump height for 4 seconds. Firing Maeve’s weapons or using another ability will cancel Prowl. Midnight: Enemies within 300ft of Maeve have their vision restricted by a 30-foot radius for 4 seconds. Lex is a great, all-around Flank for beginners thanks to his auto-aim ability, Combat Slide for quick engagements, and powerful dual Magnums. Magnums: Dual semi-automatic Magnums that deal 350 Damage per shot. Effective up to medium range. In Pursuit: Begin rapidly firing your Magnums at the nearest target to you with perfect aim. Deals 1,050 Damage over 1.4s. Acts as a weapon attack. Retribution: You have a Retribution target that is revealed to you when nearby. Killing your target grants additional Credts if they are on a killstreak. Activating Retribution randomly selects a new target. Combat Slide: Activate to quickly slide forward in the direction you are facing, retaining the ability to fire your weapons. The Law: Release an infallible surge of judgement, executing targets at or below 65% Health. Targets above 65% Health will take 600 Damage and be slowed for 1s. 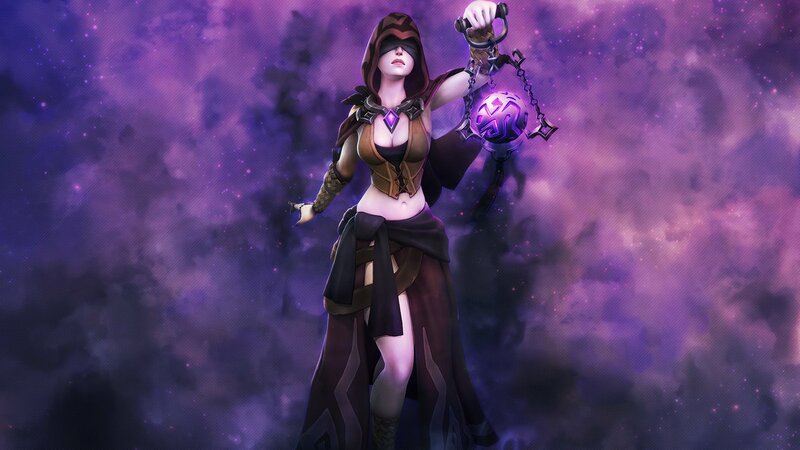 Seris is ideal for Paladins players looking for a straightforward Support Champion with great healing capabilities. Seris is one of the easiest Support Champions to pick up if you're a beginner. She's a straight-up, no frills healer with a useful set of abilities. Soul Orb: Fire a stream of magic projectiles from your hand that deal 210 Damage every 0.3s. Your projectiles pass through enemies and apply a Soul Orb stack with every hit. Stacks up to 4 times. Restore Soul: Restore the soul of an ally, healing them for 1,000 Health every second for 2 seconds. Rend Soul: Detonate all of your active Soul Charges. Deal 100 Damage to the afflicted enemy for every charge detonated. Every charge detonated also heals you for 15% of your maximum Health. Shadow Travel: Step into another plane of reality for 4 seconds. While this ability is active, you are in stealth and immune to all harmful effects. Convergence: Cast your soul core into the battlefield. After a delay, a tear in reality will manifest and drag in nearby enemies. Jenos is another great option when looking for a strong Support Champion. Jenos can lock enemy Champions down, has great movement with his glide, deals a surprising amount of Damage in a pinch, and can even heal through walls. Star Splitter: An otherworldly weapon that channels the power of the stars. Deals 108 Damage every 0.13s at medium range. Astral Mark: Apply a celestial blessing through all obstacles, healing for 220 Health every second for 10 seconds. Void Grip: Channel gravitational energy and lift an enemy up, dealing up to 360 Damage over 2.5s. If the victim manages to move while lifted, it will interrupt Void Grip. Stellar Wind: Lower your weapon and move 65% faster while increasing your jump height and lowering your fall speed. Through Time and Space: Lock yourself in place and gather the power of the cosmos for 1.5s becoming CC immune, then unleash your energy in a long-range blast that pierces through all obstacles and deals 2,400 Damage. 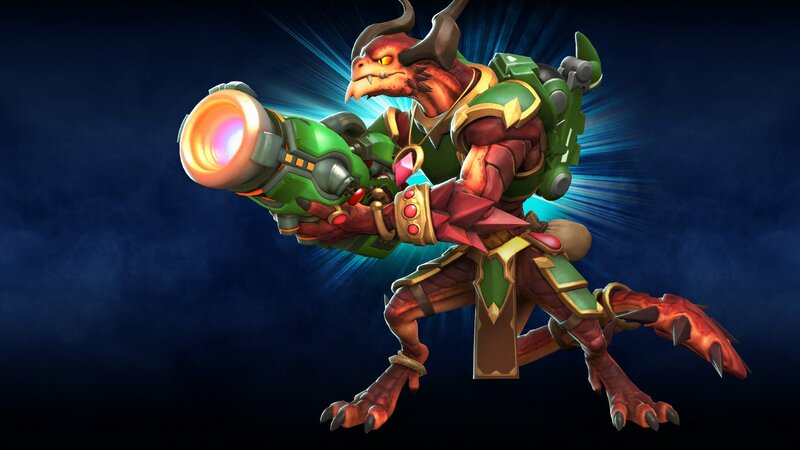 Drogoz is one of the most popular Damage Champions in Paladins thanks to his high Damage output and ability to fly. Drogoz is one of the most popular Champions in Paladins, and it's easy to see why. Drogoz has always been a powerful Damage Champion in Paladins with the ability to deal massive amounts of area damage. Rocket Launcher: Bombard lesser creatures with explosive rockets that deal 850 Damage per shot every 0.85s. Fire Spit: Enemies hit by your flammable saliva take 150 Damage and receive 30% additional Damage from your attacks for 4s. Bonus Damage occurs when you shoot your Fire Spit to cause an explosion that deals 1,000 Damage. Salvo: Pre-load all of the rockets from your magazine into your launcher. Your next fire will release all of the pre-loaded rockets. These rockets create larger explosions and deal 250 Damage per shot. Deals 200% more damage to shields. Thrust: Jet upwards into the air. Hold spacebar (or console equivalent) to use your booster. Dragon Punch: Unleash your fury and overclock your thrusters to deliver a high velocity punch that deals 100% of your target's maximum Health as Damage. While he may not be as fancy as some of the other Damage Champions in the Paladins roster, he's arguably one of the best for beginners. If you're new to Paladins, Viktor is ideal as he acts like a standard FPS shooter. Assault Rifle: Fire one shot every 0.1 seconds that deals 135 Damage. Effective up to medium range. Iron Sights: Look down the barrel of your rifle. Gain improved accuracy but move 50% slower. Frag Grenade: Throw a fragmentation grenade dealing up to 750 Damage. Holding Q (or console equivalent) will cook the grenade and reduce its detonation time. Hustle: Lower your weapon and run 65% faster. Barrage: Bring up your Targeting Binoculars. Click on enemy players to guide an artillery shell dealing 1,400 Damage to their location. Viktor's movement speed is slowed while channeling Barrage. Torvald is a Front Line champion determined to remain firmly rooted to the Objective in Paladins. Seasoned players will likely know the feelings of trying to take Torvald out, only to be shot clear off the side of the map thanks to his Ultimate, Hyper Beam. Gauntlet: Torvald releases a channeled beam of energy that locks onto an enemy and deals 50 damage every 0.1 seconds. Recharge: Torvald regenerates 850 Shield Health per second for 2.5 seconds. Channeling on an enemy Shield siphons 2,000 Health per second, regenerating Torvald’s Shield. Protection: Torvald projects a 2,000 Health Shield onto an ally for 2 seconds. Runic Blast: Torvald shoots out a short range blast that Silences and Disarms enemies for 1.5 seconds. 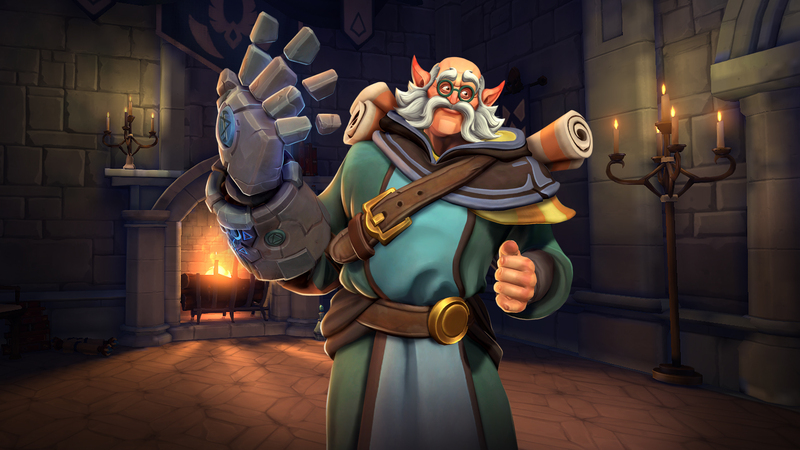 Hyper Beam (Ultimate): Torvald unleashes the power of his Gauntlet, channeling a blast that applies a massive knockback to all enemies for 2.35 seconds. Fernando is another great Front Line Champion for beginners in Paladins. Fernando plays somewhat similar to Reinhardt in Overwatch thanks to his powerful shield, however he has other abilities that make him a worthwhile choice. Flame Lance: A short-range flamethrower that deals 35 Damage per hit every .1s and applies a "Damage Over Time" effect for 200 Damage over 2s. Flame Lance cannot be manually reloaded and instead recharges when not being used. Shield: Expand your Shield to block 8,000 Damage for 10s. You cannot attack while your Shield is active. Fireball: Shoot a ball of fire that deals 450 Damage. Charge: Dash forward at great speed dealing 200 Damage. Immortal: Fernando and all allies within 70 units cannot be brought below 1,500 Health or affect by "Damage Over Time" effects for 4s. These are just a few of the best Champions in Paladins between each class. Which Champion is your favorite to play: Flank, Support, Damage, or Front Line? Let us know in the comments below! For more on Paladins, be sure to check out some of our previous guides including how to unlock new Champions in Paladins, the best Paladins Champions to play in August, and the best deck build for Ying in Paladins! By reviewing this guide, you should know now which Champions in Paladins are the best in each class.